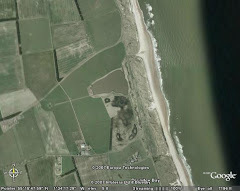 I bumped into Andy McLevy at Druridge, just as the rain began, before I set off to count the ducks for WeBS count day. I was just in the hide when he was on the phone "there's a black-headed wagtail at Cresswell"...So the count was interupted and I headed south to Cresswell Pond. It was worth it, the bird was absolutely stunning and gave excellent views to the gathering twitch. I did take some digi-scoped records shots but they were awful, for some quality shots check out John Malloy's blog. I've not seen this race of yellow wagtail in Britain before, shame it hadn't been a mile or so north! I believe there is discussion about the exact racial identity of this bird, please get it sorted out and let me know what you all decide before I write my bit for the NTBC bulletin. Back to Druridge, the WeBS count threw up nothing as exciting, a house martin was the only year-tick and there were no interesting waders, even the five black-tailed godwits Andy had seen earlier had gone. I found a meadow pipit nest with three eggs in it soI shall be keeping an eye on that.